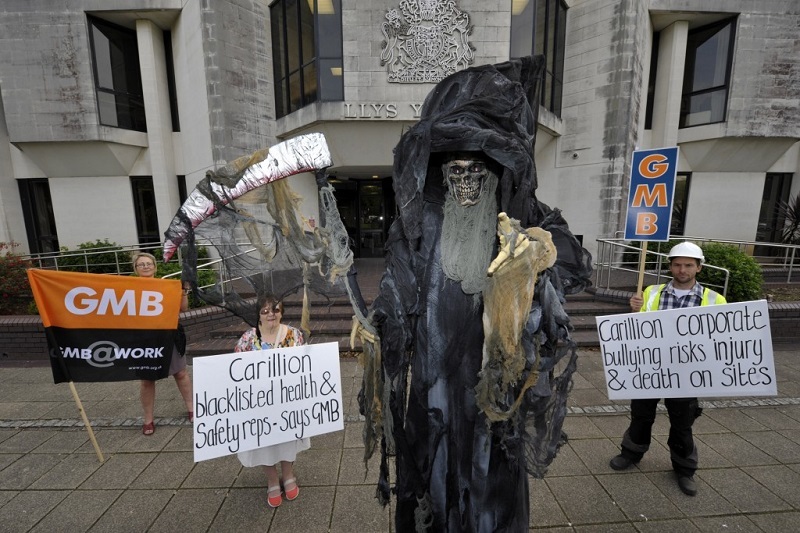 The Grim Reapers are huge stilt walking characters standing around ten feet tall. Complete with scythes and spooky glowing eyes. These corporate entertainers are available as human statues with hidden speakers that play eerie music and screams when the statues move! 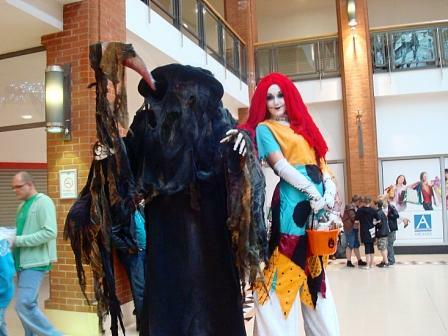 Perfect for Halloween events and shopping centres. 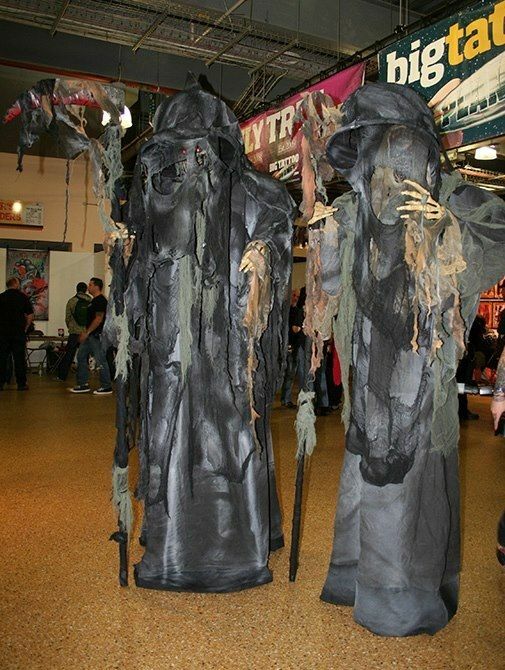 The Grim Reapers can perform up to 1 hour as living statues and a further 30 minute set as a stilt walkabout act. If the characters are being booked for just stilt walking they perform 3 x 30 minute sets. 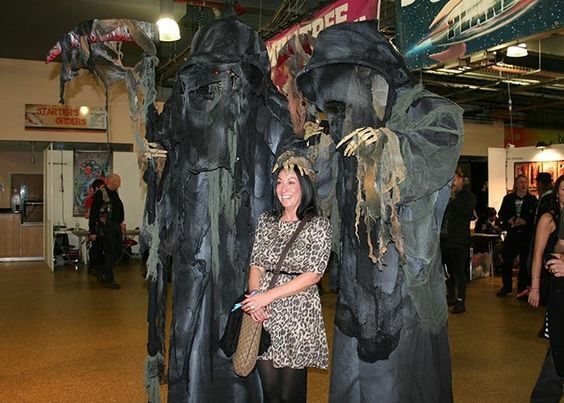 at ease and to this day they are still talking about the stilt walkers. It really is a professional service with a smile. Excellent in every respect!!! I would recommend them to the Queen!!!! I and the whole Royal Variety team would like to pass on our sincerest thanks to you for taking part in this year’s show. It was lovely to meet you all; you were all such a pleasure to deal with over the weekend, you guys did an amazing job! We’re all still trying to get over a) those amazing feathers and b) the sight of seeing you all crouching down and climbing up and down the stairs in that theatre on your stilts!! Just a note to say thank you to you and all your team for all your hard work. The whole show was amazing from start to finish and the party was a huge success so thank you very much. Our guests were truly amazed to see you. Your costumes were magnificent and I cannot express how grateful I am for doing such a magnificent job. The event was a fantastic success and the performers certainly added to the whole experience on the night. They were great – mingled with guests and the fire performers went down very well! So thank you very much for all your help with the event – I hope we’ll be working together again in the future. Everything went really well thanks… pass on my thanks again to them all. The fire and glowing jugglers worked really in the open space as it got darker! Really useful to know that you have some local entertainers, as we perhaps think majority of your guys are London based. I’ve let the team here know about my positive experience and to ask you about local performers if they have anything coming up. Thanks for all your help with it. Everything went really well. Your performers were excellent! They were fabulous; they got really involved in the evening and helped us with the raffle and encouraged everyone to get up to dance. Would highly recommend them, we have had lots of positive feedback from all the staff who attended. Please pass on our thanks, hope to work with you again. ..Stole the show by far the branchs XFactor. Brilliant personalities, full of fun and fully embraced the day…A massive thank you from us here at MK great working with you once again. It seems that the Thomas More Square inhabitants were very responsive to bunnies on stilts handing out delicious chocolate eggs! Both boxes of eggs were completely gone and people were asking for a lot of pictures, so I am pretty sure it went well. The event was a great success and well received by all. Thank you for all your help. All stiltwalkers were professional, happy to take direction and pleased with the reaction. Neil was a great help and everything came together really well. Please pass on my thanks to everyone. Please send on my thanks to Mikey, he was superb, I dont know how he can throw those moves on the dance floor whilst stood on stilts??? He was very attentive, inter acted with the guests well and fitted in perfectly with my black and white striped theme. He even danced with the Head of first direct when I asked him to take her to the dance floor, what a STAR.